Farah Gulaid, OD, joined the Emory Eye Center in August 2016, as part of our medical/surgical care team with an emphasis on glaucoma. 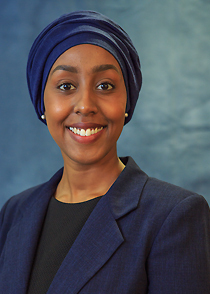 Dr. Gulaid earned her degree in optometry from the University of California, Berkeley and followed that education with a residency program at the Baltimore Veterans Affairs Medical Center in Baltimore, MD. During her residency, she completed a five-month clinical rotation at Wilmer Eye Institute, Johns Hopkins University, in addition to working with several private practices in the areas of retina and glaucoma management. She gained additional experience through externships at Bascom Palmer Eye Institute in Miami, FL, Walter Reed Army Medical Center in Bethesda, MD, and Veterans Affairs Medical Center in Reno, NV. She has administered vision screenings and provided care for adult and pediatric patients, including volunteering with a group that assessed more than four thousand patients in Mexico and the Dominican Republic.